It's no secret that establishing credibility and leadership is necessary for CISOs to get the resources they need to execute on a comprehensive cyber strategy. CyberStrong automates cyber program measurement to support a holistic, metrics-driven cyber strategy that both business and security leaders instantly understand. 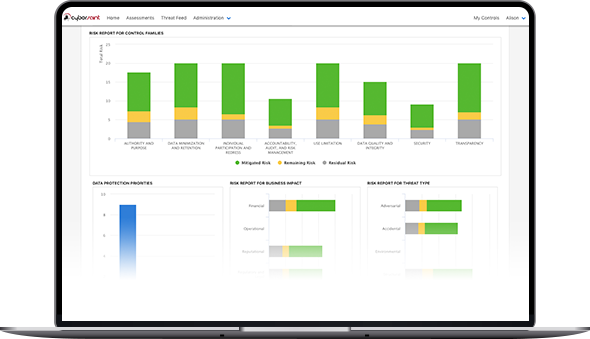 A strikingly easy-to-use interface provides visualization and executive reports that clearly communicate performance, focus areas, resource needs and ROI. Security teams can easily take on any additional requirement as the business grows and CISOs can monitor program success dynamically. Implement the language of cybersecurity for the future of business. Handle any regulatory framework, standard or customer requirement with unprecedented ease. Experience unmatched visibility into your compliance and risk posture, and always know the answer to questions about your security progress and effectiveness. Be prepared for every opportunity and secure your business potential with metrics-driven cyber program management. Automated board-level, executive or customer-ready reports add confidence and measurability, and help all stakeholders speak a universal language for cyber. Meet IRM program goals efficiently with AI-powered suggestions that lead your team to low-hanging-fruit mitigation opportunities. Lead a team that values proactivity, acts with agility and harnesses automation to concretely get the most risk reduction for the best return. Use compliance measurement and risk quantification to start the conversation with your non-technical peers, and have an instantly understandable, high-level view of how your integrated risk management program has lowered risk in your organization. Use powerful risk and compliance based analytics to propel the conversation from check-the-box compliance to proactive risk measurement. Dig into your business impact analysis, financial, reputational, and other forms of risk, threat types, and more drawing from intuitive reports and powerful dashboards. "As CISO of Bright Horizons, communication on the cybersecurity posture of the company to executive management and other stakeholders is a critical responsibility. Bright Horizons management can now evaluate clear gaps and work with my team to manage risk across the enterprise." Adopting the NIST Cybersecurity Framework can be difficult. Here's a webinar on how to simplify adoption presented by former CSO of Fortune Global 500 global critical infrastructure corporation, and CyberSaint CEO and Founder, George Wrenn. Reporting is a necessary capability of a robust integrated risk management strategy. Take a look at 4 executive reports every CISO needs to succeed. Do you have customers in the EU? Even if you don't, it's best to implement a strong data privacy and protection program. Here is some GDPR guidance to get you started. Understand how CyberStrong uses artificial intelligence and machine learning to deliver real-time insights and actions to reduce risk and increase visibility into your environment. Looking to Measure Your Program Against the NIST Framework?